In a 1988 proclamation, Ronald Reagan, who was the U.S. president at the time, created a national day for senior citizens. Still today, National Senior Citizens Day is annually observed on August 21. The observance was established to recognize and support senior citizens who make a positive impact in communities across the U.S. It also was created to raise awareness of the social, health and economic issues that affect senior citizens. 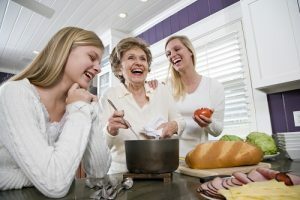 Many communities celebrate Senior Citizens Day with events, activities and special gatherings for senior citizens, their families, friends and volunteers. Some businesses, such as retail stores and restaurants, offer discounts or special promotions to seniors on or around August 21. Just visit. Spend time with the senior citizens you know and tell them how much they are loved and appreciated. Sometimes providing simple companionship and conversation can lift spirits and reduce loneliness. If parents or grandparents live out of town, video chatting is a great way to stay connected. Encourage your tech-savvy senior to use Skype or Facetime instead of the phone. Volunteer. Some seniors may not have friends or family close by. You can volunteer at a retirement home and spend time with those who may not otherwise get a visitor. Plan a family night in. Schedule time for the family to watch a movie or play a board game with your senior loved one so that everyone – from grandkids to grandparents – can spend time together. Plan a fun outing. If your senior can be out and about, take them to lunch or dinner, see a movie or play, or surprise them by participating in their favorite hobby, whether it’s bowling, playing cards or cooking. A little physical activity can have a big impact on their health and well-being. Learn your family history. Talk to your senior loved ones about their memories and life experiences. Learn about their time growing up, seek their wisdom and advice, and start gathering family stories. Consider collecting old photos and even documenting your conversations on video. At FirstLight, we help seniors enjoy the best quality of life for as long as possible by sending caregivers into homes to assist with services such as Companion Care. Learn more about our senior home care solutions that help keep your loved one happy, healthy and independent. Contact FirstLight Home Care today.